The European Spallation Source marked an important milestone today at the construction site in Lund. Now the organisation is a European Research Infrastructure Consortium (ERIC), a type of legal entity created by the European Commission for governing international research facilities. 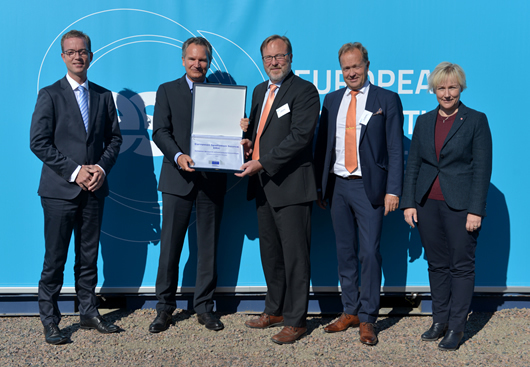 The European Commission's Director-General for Research and Innovation, Robert-Jan Smits handed over the official ‘plates’ of the ERIC from the Commission to ESS. He was joined by the Swedish Research Minister Helene Hellmark Knutsson, and her Danish counterpart Esben Lunde Larsen, as well as representatives from the partner countries. The European Spallation Source is the first ERIC established in Scandinavia and the eleventh in Europe. 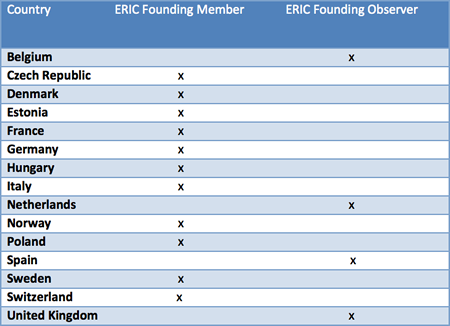 The establishment of the European Spallation Source ERIC provides ESS with legal status in all the Member Countries, enabling them to participate in the governance and directly contribute to financing ESS. The new facility is the world's next-generation neutron source and one of the highest priority research infrastructure projects in Europe. The EU has approved projects for ESS under its Horizon 2020 programme for €20 million. The project BrightnESS includes 18 European institutes and universities from 11 countries, over 36 months. It includes the Universities of Lund and Copenhagen, as well as CERN in Switzerland. The European Commission confirmed the establishment of the European Spallation Source as an ERIC formally in mid-August, and the decision took effect as of the 31st of August. The Founding Members are the Czech Republic, Denmark, Estonia, France, Germany, Hungary, Italy, Norway, Poland, Sweden and Switzerland. Belgium, the Netherlands, Spain and the United Kingdom joined as Founding Observer Countries and plan to become Members in the near future. Greece also has indicated a wish to become an observer. The European Spallation Source ESS AB was originally established as a Swedish limited liability corporation, owned by the Swedish and Danish governments. Now that company will complete a transfer of assets, obligations and personnel to European Spallation Source ERIC by October 1, 2015, and will be closed after 2015. More photos from the event can be downloaded below as they become available. Please comms [at] esss.se (subject: ERIC%20Plate%20celebration) (contact us) if you require higher resolution photos.